I wanted clean wine glasses. 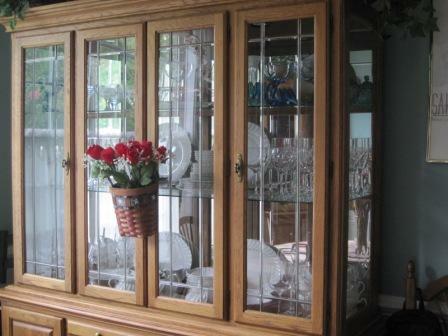 I have a China cabinet with glass shelves, mirrored back, glass paned doors, glass panel sides. It shuts tightly, but apparently isn’t air tight. I don’t know how or why, but film forms over everything. There isn’t any visible dust, but a darkening film. So, my first couple wine glasses, the ones that get used every once in a while, were clean. The rest had a film on them. First I was only going to do the white wine glasses. Then I decided I used the red wine glasses, too. What the heck. I emptied the dishwasher of the clean dishes and loaded the top rack with all the filmy white and red wine glasses. Then I took the martini glasses and put them in. Then the bottom rack was empty. I know why the bowls sitting out get a film on them. It is the kitchen and grease just happens while we cook. And the grease makes a film and then the dust sticks to it and makes an even lovelier mess. So, I filled the bottom of the dishwasher with some of the bowls. I started the dishwasher and then noticed how there were clean spots on the shelves in the China cabinet. This couldn’t be good. And the champagne glasses looked horrible. I was going to have to clean the entire thing. 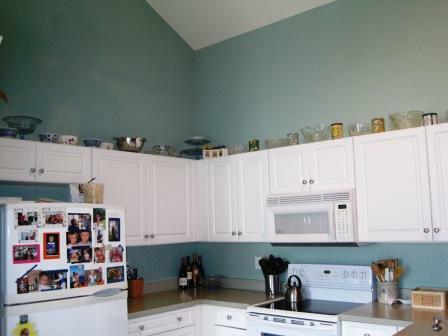 I took out all the pretty bowls on the top shelf and hand washed them. I hand washed the champagne glasses. I actually use the China itself so it doesn’t get as icky and didn’t need to be washed – except for the sugar bowls that felt funny when I picked them up. So I got out the glass cleaner and furniture polish and cleaned the cabinet. I then looked around at the rest of the pretty bowls sitting on top of the kitchen cabinets and figured if half of them were going to be washed, the other half might just as well get cleaned, too. And the sink was already full of hot, soapy water. So I climbed up and down and up and down again until I had all the dishes washed. The dishwasher still isn’t done running so this took me less than an hour to do. But it is a major undertaking and I hate doing it. However, I love the way it looks when I’m done. So it isn’t all lost. It took a bit longer after everything dried to put it all back together again. I did a bit of rearranging with some of the pretty bowls. There isn’t as much leeway for all the wine glasses. A ridiculous amount of wine glasses, considering how rarely I drink. But they are available should the need arise. I have clean wine glasses. Alex – not my “best neighbor” when we lived in Cincinnati, but the storm brewing in the Gulf of Mexico. When we think of hurricanes, we think of high winds blowing things off the map. We think of big swirling masses of air wiping out entire villages or even cities. We think mass wind destruction. According to The Weather Channel, more people die of water in a hurricane than die from the wind damage. Part of the water problem is the storm surge. The big swirling mass of wind puts pressure on a large surface area of water, pushing it ahead of the storm. Storm surge waters can combine with high tides to create more havoc, but the surges themselves are problematic. Even worse is the amount of rain associated with a hurricane. This rain can travel farther inland as well, unlike the storm surge. This rain can cause major flooding both along the coastal region hit, and also inland as the storm moves toward its final dissolution. In June 2001, the tropical storm, Allison, moved toward Houston and did $5 million in damage – and it was just the remnants of the storm dropping all the absorbed moisture. So what causes some storms to be rainier? It isn’t the intensity of the winds, but rather the speed of the storm’s movement over water. Rainfall is inversely proportional to speed. This makes eminent sense. The slower the storm moves, the more time it has to pick up moisture. Once it slows down to 10 mph or less, it really picks up the water. First, Alex’s forward motion is expected to be slow. The farther north the storm moves, the slower it is expected to go. 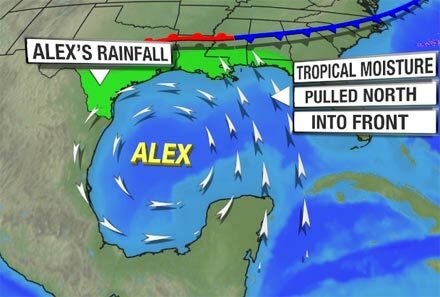 No matter what the track, Alex is seen to be moving slowly both over water and over land. “Alex has a long fetch of deep moisture” is the next point. Since I had no idea what the term “fetch” meant in this instance, I looked up the definition. It is the distance upstream of the measurement site (eye of the storm, I assume in this instance). This second graphic is illustrative, showing even more bands of storm issue to the east and north of the center, which makes for lots of moisture upload. Lastly, there are previous fronts to contend with – in the picture, that would be the red and blue line holding back the quick dispersal of Alex. Usually these fronts die out over the Tennessee Valley and Southern Plains, but in a trifecta move toward a perfect storm, this isn’t happening right now. Instead the front is making a “wind shift” line which would be a target area for the formation of rain and thunderstorms. This doesn’t even talk about the oil floating around in the Gulf at this time, nor to the recovery efforts and how this and later storms will affect those. But I thought it was interesting and had no idea why some hurricanes were so rainy and others – not so much. The reason I love writing (and reading) is the opportunity to learn. I’m not completely computer illiterate. There are tons of things I don’t know, but there are many things I do know. One of the things I know is that if you go around indiscriminately clinking on links, you will probably not have a computer for long. There are a group of people I thoroughly dislike. I try not to lump people into a group and just hate the whole group, but I have to tell you, this is one of those times. I hate people who write viruses, malware, or any other code that has as its dual purpose wreaking havoc and separating people from their money. I dislike the whole group. All of them. I realize there are people who attempt to hack programs in order for security to find out where the weak spots are. These aren’t the people attempting to wreak havoc. I’m talking about people who are just mean, low-down vile assholes. I don’t like them. At all. Because I’m aware these people exist, I know not to click on questionable links. I know not to just click away hither and yon, not knowing what will pop up on my computer screen because more often than not, what pops up isn’t anything I would have sought out on my own. Yesterday afternoon, I got home from work and fired up my little netbook. My laptop was already running and I don’t even remember why I wanted the other computer. I just did. Shortly after 4.30 PM I started getting a little pop up in the lower right corner of my screen. It would take over the computer, getting in front of anything else I was doing. When I was playing a game in full screen mode, it would knock the game out. I have a picture of the offending message. Not very much information there. Just click for something free – like a virus maybe? I tried to alt+f4 my way out of it, but that didn’t make it go away. The red x was my other choice, I took it and prayed I wasn’t taken somewhere nefarious. The little thing went away. Then it came back – over and over again. I looked for something in Task Manager after doing the Control+Alt+Delete thing and there were no applications running and I couldn’t tell what processes were supposed to be there and what was this thing. I have Panda antivirus on the netbook and it saw nothing wrong. I hadn’t already gotten Spybot or Malwarebytes on it, so I downloaded them and got the most recent updates. I then did complete scans and they found nothing. The little message box kept popping up. The only other thing I could think to do was to do a system restore. So I went back in time to the day before yesterday and restored my system. That seemed to work. At least I thought it did and then POP, there it was again. I hadn’t done anything with the computer other than let Microsoft update whatever it is they update all the time. I didn’t even go anywhere weird online. I looked at my history in both browsers I had used and there was nothing there. I was stumped. I put up a notice at Facebook and no one else had an issue. I also put up my sad story at MWC, my writers’ forum, and there were several people there with the same problem. None of us knew what it was, no one was dumb enough to click the link and see where no man had gone before. We all like our computers too much. We chatted back and forth about this and then all of a sudden, the every twenty minute reappearance of the pop up stopped. It went away as mysteriously as it came. We don’t really know why that happened, either. It might have been happening to so many of us at MWC because we mostly use Panda antivirus there. It is created by people who don’t speak English as a first language. Sometimes there are issues with the translation. Perhaps they didn’t realize we here in the paranoid world don’t click on links without more of an explanation. That is one theory, but I have Panda on both computers and only the netbook, not the laptop, had this thing going on. Perhaps it was a virus written by some cretin out to destroy mankind or many just my computer and Panda finally got the fix for it. Perhaps so many of us at MWC had the same problem because we got it from that website somehow. I don’t know what it was. I’m glad it is gone. I really like my computers functional and without jarring notices taking control of the screen every twenty minutes. How much is time worth? How much should we be willing to sell our time for? When faced with a choice, is it better to make not very much money doing something you love, or to have the grit and determination to hold out for a reasonable exchange of cash for talent? I am an author. I write. I write mostly non-fiction, but I have also written fiction. I have over a dozen short stories published (in charity books, but still) and I have an unpolished novel sitting here on my computer. I have blogs. I have Little Bits of History on the other side of this Word Press blog, and I have this. I have had other blogs in the past. Some of my writing is more inspired but it is readable, either way. I also write an article once a week at Really Good Quotes. I started out writing my history pieces there and somehow got bumped up the page to writing the lead. 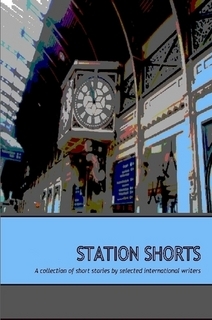 I’ve had a short story published at Short Story Library dot com. And I’ve had a true story published at Milspeak dot com. I love to write. I am grateful that there are people who are willing to trade a few minutes of their precious time in order to read what I have written. I find it amazing, knowing how pressed for time we all are. I have been writing for Examiner dot com for over a year. I faithfully put up one essay per day, never missing a single day for over a year. Even when on vacation, I managed to find internet connections allowing me to upload my articles. I have planned in advance so when I was going to be busy, I would also have content available, ready to post. A friend from my writer’s forum suggested this to me. I gladly took the bait, thinking I would like to be paid. For while I do write for a variety of places, no one ever pays me. When I started writing for them, Examiner was quite a bit smaller than they are now. One would think that as they grew in size and scale, things would improve. One would think that and one would be wrong. When I first started writing, there were a number of ads on each page because that is how the internet works. Free content has to be paid for in some fashion. The ads are what pays for space in the lands of 1s and 0s. The ads have gotten steadily more annoying. Most of us hate popup ads so much, we install special widgets to keep them from popping up or under. Because this is a known annoyance, one would think that companies who need people to choose their webpage over all the bazillions of other webpages out there would choose to not have popups. Again, you might think that, but you would be wrong. Examiner loves popups. Every day, the first time you go to Examiner, you get a popup. Usually it is Netflix (which I just saw has a great reputation for customer service, so why they need to piss me off on a daily basis is beyond me). Since this is a known irritant, Examiner went on to incorporate some other annoying ad things. Today, I got blaring music when I first opened the page. Some days, they have the horrible, nasty, loathsome thing that takes over your screen and grays it out while the ad forces you to … well, it forces me to shut the tab. I will not be bothered with these things. I leave the site rather than suffer someone hijacking my computer. So, of course, Examiner also uses that. They want – no insist – I do all the marketing. They expect me to drive people to my page because I’m such a brilliant author, people will come from far and wide to be annoyed and put up with crap I personally hate. I tried to leave a comment about this at the Facebook fan page and they deleted it. If it isn’t fawning praise, it doesn’t stay. All this was bad enough. I went to the website which has a forum for Examiners (those of us who write for Examiner). And I noticed something else. People were talking about page pays. When I started out, I got “about” a penny a hit. Actually, it was $0.98 per view. A while ago, the reporting page was redesigned. I can see how much I’m paid per day, but the figures are now below my screen unless I scroll. I have to admit, I don’t scroll. Today, as I was complaining about the ever increasing annoyance of the ads, others were complaining about the ever decreased amount paid for page views. So, I scrolled. I see that yesterday I was paid the whopping sum of $0.612 per page view. This is so ridiculously low as to be breath-taking. It is also something not done in the rest of the business world. You don’t just lower people’s payrates without notification. We aren’t supposed to air our dirty laundry in public because how would Examiner ever rope any unsuspecting dolts into writing for them if we actually knew how little they paid prior to getting the stars in our eyes. I guess if I was able to drive thousands to my page, it would still be worth it. There is one guy who is a Fark person who gets his links greenlit there on a regular basis. Great if you can manage it, but that’s more marketing than I’m willing to do – and since I write about historical things, no one would care about it over at Fark. So, I have to decide if it is degrading to write, to edit, to find copyright enabled pictures, appropriate video, and deal with their archaic publishing tools in order to make so little money. I believe I deserve better. I feel less used when I intentionally give my writing away for free. And I know my friends, who sometimes take the time to read what I’ve written, are far less annoyed since I do not take their computers hostage before permitting them to read my brilliant prose. How much right do your neighbors have over your property? This is not a rhetorical question. I live in a community with a Home Owners Association (HOA) and these people have all sorts of rights concerning my property. We were told the rules and regulations would be redone with our input after the houses were all built and we believed this nonsense. We really should have known better. We have actually received a nasty-gram because the garbage can was at the curb five hours too early. I had to cry on the men who came to determine if I could put up the wall to make our lanai a three-season room. They didn’t know if it would be nice enough. It is on the back of the house and the only person who can really see it lives in a house where the foundation is cracked and repaired. My very expensive windowed wall is much nicer than the warped wood crap the builder put up, but still they weren’t sure. Then I cried. I got my wall. We did sign papers saying we would abide by the rules and regulations of the HOA. I mostly do abide by them. It would be nice if everyone was made to follow the rules. The dumbest thing the neighborhood did was concerning signs in the yards. We cannot put up a “For Sale” sign when selling a house. These signs are an abomination before God and Man and must not be tolerated. Signs lower the property value (but I’m not sure how). Then they had a contest and announced the home with the best yard. We knew who it was because they had a sign in their yard. Irony? Stupidity? Hard to tell. The Atlanta Journal-Constitution is reporting on another difference of opinion among neighbors. Neel Reid built houses in the area in the early 1900s. In 1922, he built the old Henry B. Thompson House which is now owned by T. Ruben Jones. The 80-year-old painted the house and upset his neighbors. These old historic homes are a neighborhood unprotected by Historic Standards because the powerful people who live here opted to remain without so much external control. They may be rethinking that decision now. Jones left the trim of his house an unpainted gray stucco. 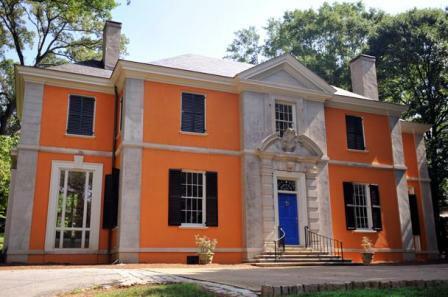 He painted the façade bright orange saying it is in line with an Italian villa and the color will fade in time. The door is a bright blue. The colors are reminiscent of the Florida Gators, something Jones says is just happenstance, not something planned. Now his neighbors are concerned. They fear the “garish” paint job will bring down property values. Jones has also redone the entire interior of the house, which had fallen into disrepair. He was the owner of a high-end antique shop and has taken great pains to upgrade his house to something stylish and beautiful. So, exactly how much say do we have over our neighbors? What can or can’t a neighbor do and how does it affect our property values? And why would anyone buy a house in a place with a HOA? These people irritate me no end. But, at least there is a golf course nearby. I really thought booze was going to be the next thing Big Law went after. I knew tobacco wasn’t going to be the end of it. I knew we would all have to be protected from the horrors of everyday life and class action suits are terribly lucrative – at least for the law firms. So I knew more was coming. But I honestly thought booze was next. I do realize we are a nation of obese slobs and am doing my part to get in step with the rest of the country. The next big thing isn’t booze, it’s food. Specifically toys used to sell “junk food” to kids who apparently are now able to drive themselves to the fast food places without parental supervision. Really? 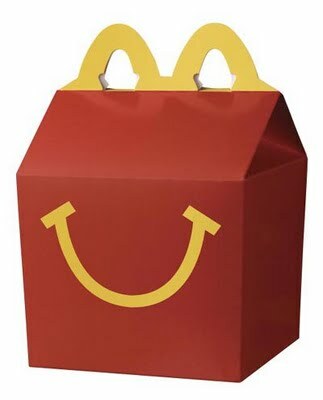 If my own sons were closer, I would ask them how many times they were given a Happy Meal with a toy inside, even though Star Wars stuff was all the rage when they were young and those toys were included. Perhaps a handful of time, certainly not more than a dozen the entire time they were the target consumer group. Why? Because we didn’t eat that stuff at all. I cooked. I worked (part time but odd shifts including weekends and holidays) and I cooked. I even had food cooked before I went to work, or I had the menu planned out so their father could cook while I was at work. There isn’t a company on the planet that could “undercut” my authority because I actually had some. The response to whining was, “I said ‘no’” and not me caving in to any whining. So there was little discussion. So, let’s say, just for sake of argument, there are no more toys in Happy Meals or any of their ilk. Will this all of a sudden make parents stop going to the drive through? Will they no longer buy a Happy Meal but instead get a Big Mac, supersized fries and a huge jug of soda? How will this help? The problem isn’t that fast food restaurants include a toy with the scaled back meals designed for kids, the problem is that too many parents drive through too many times during the course of a month (perhaps it is per week). I just also read a study that graham crackers were deemed tastier by small people if there was a cartoon character on the box. Carrots were said to taste better, too. Not by as much as the sugary snacks. Carrots taste like carrots even if Bugs Bunny is eating them. But cereal is better if Dora is on the box. I guess this will be next target of those who know what is best for everyone. What they didn’t test was putting Dora on a box of unsweetened plain cereal and giving that to the kiddies without any added sugar, and then having them taste some Sugar-In-A-Box-With-Some-Oats-Under-It brand. I’m betting plain oats even with Dora wouldn’t taste better than oats with tons of sugar out of a plain box. But that isn’t what they wanted to prove. I am assuming all the toys in cereals and other foods will have to be eliminated as well. These have been included for quite some time as evidenced by A Christmas Story’s decoder ring from the Ovaltine campaign. In times past, parents were able to say “no” and children understood this to mean the request was denied. Apparently, our children are no longer able to understand the meaning of this handy little word, possibly this is due to underuse. This is nothing that needs a lawsuit. This is something that needs responsible parenting. This is a money maker for lawyers. Taking the toys out will not eliminate the line at the drive through. What it might mean is that kids will be given even larger orders with even more calories. That would be one of those pesky “unintended side effects” that occur when the problem isn’t properly thought out. The CEO of BP had the unmitigated gall to race his boat this past weekend. There is a problem over here in the Gulf, Mr. Big Shot. I’m going to guess the beleaguered CEO of BP is more than just passingly aware of the fact that oil is leaking into the Gulf and washing up on shores. I would like to point out something no one seems to be talking about. This guy, Tony Hayward, doesn’t know how to stop the oil from leaking into the water. He isn’t supposed to know how to stop the oil from leaking into the water. He is supposed to run a company. He is a businessman. What he should have had was a plan for any disasters and backup plans should they be needed. He should have had a list of eminent scientists who could fix the problem. But really, this guy is a CEO not a SCIENTIST or ENGINEER. He is not capable of fixing this problem. President Obama played golf this weekend – after his staff complained about Hayward’s yachting events. Hey, President Guy, we got a problem over here in the Gulf – you know – with a U not an O.
I would like to point out something we aren’t willing to admit. Obama doesn’t have a clue as to how to stop the oil leak. He isn’t supposed to know how to stop the oil leak. He is supposed to be a leader. He’s a politician. Anyway, a plan. There should have been a plan. As a nation of engineers and scientists, why is no one coming up with a plan? 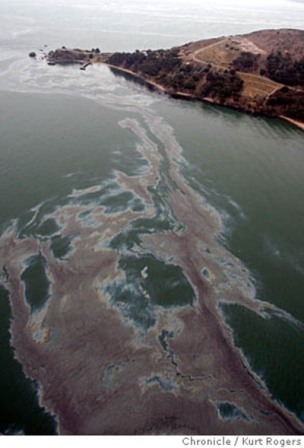 Surely there are some scientists or engineers or physicists or someone with some brains who can figure out how to cap this or funnel the oil to the surface in some way so as not to pollute the entire Gulf. But really, Obama is a PRESIDENT not a SCIENTIST or ENGINEER. What the White House might want to think about before casting stones, is what their own behavior looks like. Both men sought out the jobs they hold. Neither of them is trained in the subjects needed to actually go out on the water and lead a team of somebodies who can cap the oil leak. Both men need to spend some time away from a problem to come back to the task at hand with a fresh outlook and a new perspective – and possibly some renewed energy. What needs to be done is this: find the proper people who can figure out some way to fix this problem. Neither the CEO nor the President is that man, they are the catalysts. And either they BOTH can take a day of respite, or neither of them should.